Here's a story from the owner of a 13 year old, beautiful Audi S4. He reminisces about buying the car, maintaining it's minty condition and enjoying it on weekends regardless of the weather, being an S4 this car excels where others might shy away, and finally the time to consider parting ways and finding a new owner for the car who will care for it as well. Having gone through a similar series of emotions with my own 'old car', right down to finding a justified new owner, this story just rings so clear of the passion we all have for these things. Farewell. 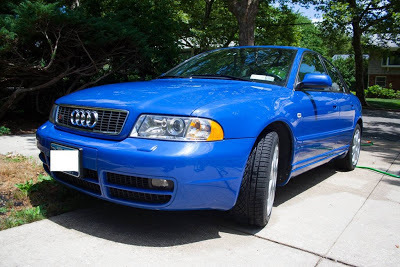 "I'm about to meet a few prospective buyers for my B5 S4. 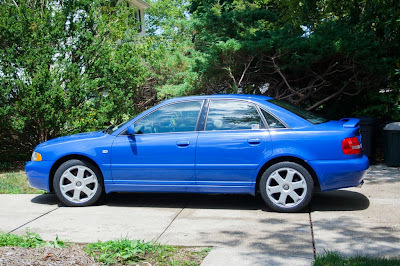 I'm moving to the city and will no longer have a garage, or the time to give it the attention a 13 year old car needs and deserves. I want to honor it by telling its story to some people who will sympathize. The car was a huge landmark in my life. I fell in love with the S4 in college. Who doesn't love a twin turbo V6? The styling is so subtle. 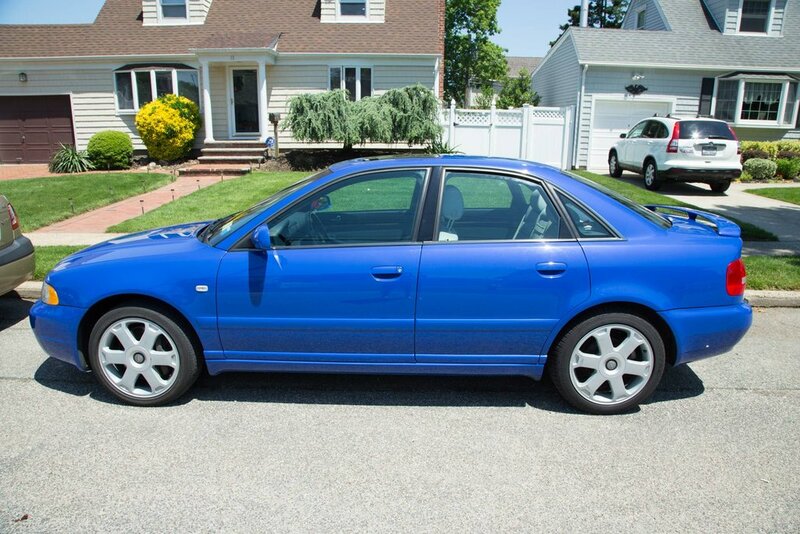 It looked like a regular A4 to the masses. This isn't a chick magnet. It's not a traffic light Civic-racer. But to those who knew what to look for it garnered its due respect and love. Years later at my first job I had the dealer catalog page cut out and hung above my desk. The Nogaro Blue S4 photoshopped into some impossible track maneuver. After a few years, it seemed like maybe it was too late. 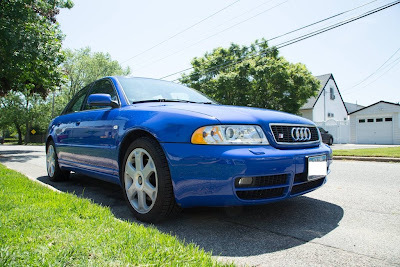 It was 2007, and 2002 cars were tricky to come by, especially in any useable form- the S4 was so easy to tune it encouraged reckless hoonage and 6-figure odometers. In passing conversation I mention I'm looking for an Audi and a coworker says "my friend is selling his A4." I ask for the details and he says "it's the twin turbo V6." I said, "No it's not." He said "Yes it is." Long story short, I meet this adorable elderly couple- the husband a retired surgeon with a penchant for sports cars, they had leased and then bought the S4 in 2000. The wife was driving it to the grocery store and parking it in the garage. I scored a 7 year old S4 with 39k miles on it. I made the decision to keep my Pontiac Sunfire to preserve the value of the lucky score I made. It was the best decision of my life. 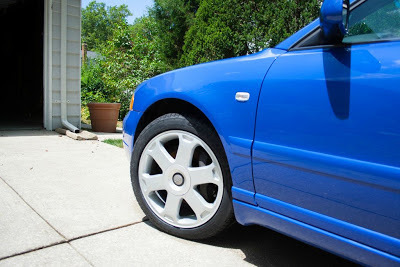 All week long I could sit in traffic in the Sunfire, park it, and then put on my weekend persona and get in the S4. The car is perfect- it fits me like a glove. The right type of mindset understands a tool that is an extension of yourself. Every control in the right place and the right position. 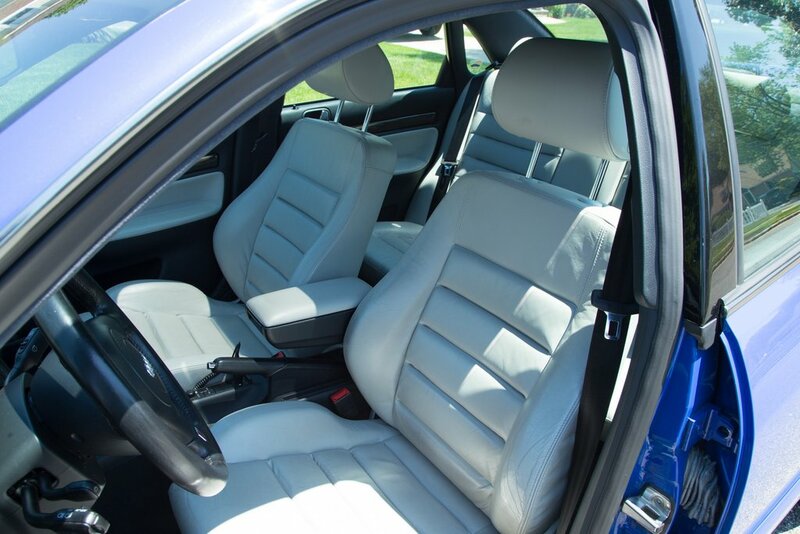 The seating position and controls were so effortless I could lose track of myself and the car and I would become one. And the AWD- if you've never experienced the joy of a torsen differential in the snow, then you are missing out on one of the biggest joys of driving- there's nothing like the feeling of a perfectly controlled 4-wheel drift around an exit ramp. I was the only maniac pulling my shiny sports car OUT of the garage when it snowed. Now many years later, my daily driver is more tolerable and my living situation is changing, so I have to move on. Besides, 13 years is a long time, perfectly preserved or not there are things that get old. 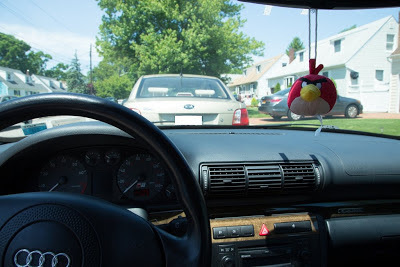 The Nav system which can only navigate 1/6th of the country at a time; listening to my iPhone through a cassette tape adapter; the dashboard display losing 1 line of pixels at a time until it's almost unreadable. It's age is showing. The car represented a stage of my life, a goal achieved and a welcome into adulthood. I'll never forget the love of driving it gave me. ... I just showed the car to a good hearted young dude who was super enthusiastic about the condition. He's a German car fan, and he wants to keep it bone stock. He offered me cash and I want to sell it to him just because he'll be a good owner. My dad is yelling at me, "You're not selling a puppy, get the most you can for it." But I like this kid too much."